Colonial Revival is the most popular architecture style in America, and it continues to flourish today. It was inspired in part by the 1876 Centennial Celebration. The style took off in 1890 - at the time that "manifest destiny" was at its peak - when Americans began to value their own architecture and heritage. Interest in Victorian architecture was beginning to wane as Americans sought architecture that reflected American values and traditions. Colonial Revival architecture was also helped along by the reawakened interest in classicism by the dozens of American architects who had trained at the Ecole des Beaux Arts architectural school in Paris. 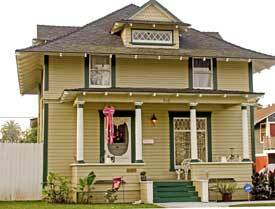 The style was popular from 1890 to 1940, but between World War I and World War II, Colonial Revival was the most popular historic revival style in the United States. 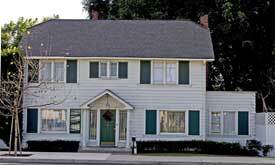 After World War II, more simplified versions of the Colonial Revival-styled house were built. California was an unusual place for the Colonial Revival style because its colonial period was Spanish, not Anglo, as was the eastern prototype. Nevertheless, by the turn of the 20 th century, the dominant culture was Anglo, and many Colonial Revival houses were built here. 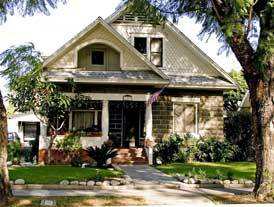 Many Fullerton settlers were from the Northeast and felt comfortable with this architectural style. 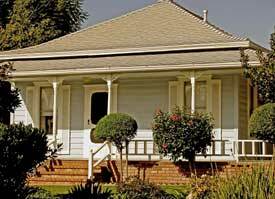 The oldest existing building in Fullerton is a Colonial Revival dwelling - the Rufus Porter House (1882) at 771 W. Orangethorpe Avenue. Other significant Colonial Revival buildings around the city include the Russell House (1898) at 516 W. Amerige Avenue; the Davies House (1900) at 150 Marion Blvd. (moved from 145 E. Commonwealth Avenue); the Noutary House (1901) at 213 Claire Avenue; the former Methodist Parsonage (1905), now Salon Benardo, at 142 E. Amerige Avenue; the Klose House (1908) at 434 W. Amerige Avenue; the Fallert House (1908) at 123 E. Valencia Drive; and the Cooper House (1923) at 2208 E. Chapman Avenue. The Colonial Revival style remained popular in Fullerton, but it was gradually displaced by the Mission Revival and Spanish Colonial Revival styles as residents sought an architecture that better reflected the Hispanic heritage of the area. In Southern California, the Mission Revival style was considered the counterpart to the Colonial Revival style popular in northeastern United States. Alexrod, Alan. The Colonial Revival in America. New York: Norton, 1985. "The American House: Colonial Revival." Old House Journal February 2002: 59+(foldout). Massey, James C., and Shirley Maxwell. "Early Colonial Revival: The Wellspring of a Neo-traditional Style that is Still Running Strong." Old House Journal June 2004: 82-89. Wilson, Richard Guy. The Colonial Revival House. New York: Abrams, 2004.